If you’re in the market for a new smartphone, Costco is running a couple deals that you may want to check out. Costco is now running special offers on the Samsung Galaxy S9 and Galaxy S9+. The retailer is cutting $100 off the price of each device, leaving the GS9 at $579.99 and the GS9+ at $699.99. You’ll also get a $100 Costco Cash Card with your purchase, effectively knocking the final price of the GS9 to $479.99 and the price of the GS9+ to $599.99. In addition to those savings, buyers will get a TYLT Power Essentials Pack with their purchase. This bundle includes a dual port 4.8A wall charger, a dual port 4.8A car charger, a 5200mAh battery, a 3-foot braided USB-C cable, a 3-foot microUSB cable, and a carrying case. The deals will be available until June 17th, so you’ve got a little time to take advantage of it. Because these is a Costco deals, though, you will need to be a Costco member to take advantage of them. The fine print also says that a full-price device purchase is also required. 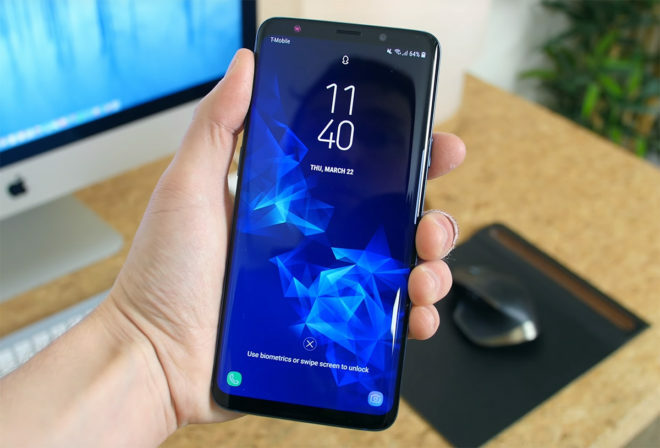 The Samsung Galaxy S9 and S9+ are two of the best Android phones you can buy right now, offering Snapdragon 845 processors, quality 12MP rear cameras (with a second, telephoto 12MP rear camera on the S9+), and high-res 2960×1440 displays with slim bezels. Normally the S9 is $720 and the S9+ is $840, making these Costco deals pretty awesome. 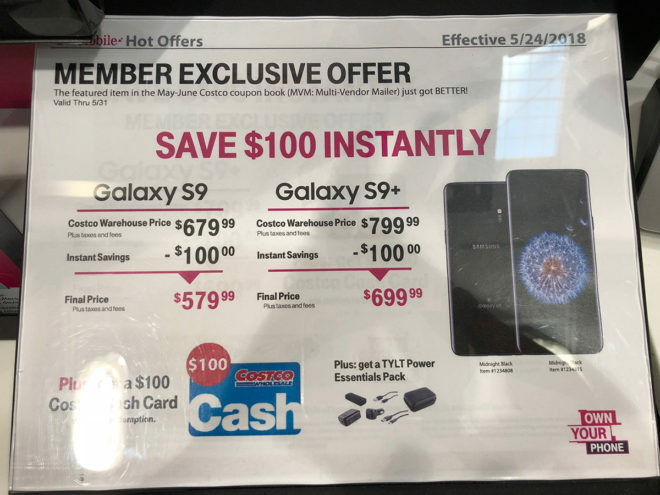 Are you going to get a Galaxy S9 or Galaxy S9+ with these Costco offers? Decent. But I’m waiting for a BOGO deal. didn’t that already pass? just had to buy on an EIP. Did it? Dang, I must have missed it then. Last year Samsung did a BOGO. This is the deal I am waiting on. I did get my Note 5 on BOGO by Tmo and it was 9 mths into its release. Same here. I wished Samsung would bring it back. The last S9 BOGO promo from TMO was a sham. It required porting and you had to be an Unlimited customer of some sort. Screw that!! Just keep it simple. I think BOGOs are gone for good, they are switching or switched to 50% EIP bill credits they are looking at long term retention of subscribers. I’m guessing too many people were churning the BOGO deals and cancelling a line, paying it off and unlocking and then selling the phone after they got the gift card. I don’t mind being on EIP since I don’t plan on switching carrier. However, a BOGO deal has to exclude adding a new line and trade-in. Just give me a clean BOGO deal. I’ll wait for Father’s Day and 4th of July. I’m sure TMO will have something. that is fine, if you are paying full price. Wonder if they are doing this via an EIP too. they don’t do JoD, just Jump! They are doing EIP and you get $200 Costco cash card +TYLT kit warehouse signup and direct delivery only, have screenshot and rebate form in links in post that is pending moderation further up. Ends 5/31 But deal also stacks with all the New T-mo Military One promos running. Also if you add a line using BYOD at Costco you get $50 Costco cash. I think JoD is just T-mo stores/CS not authorized resellers-not sure tho. Is this with $100 instant savings? In other words will it be a total of $300?? ( $200 Costco Cash card & $100 off the price)?? No the $200 Costco Cash is only for phones acquired on 24 Mo EIP. The $100 savings is for an outright purchase. But one theoretically, could payoff the 0% APR (OAC) anytime after the 90 day Costco return window and receiving the $200 Costco cash. 0% is free money to finance the phone. The not so find print requires a line activation. Not true. It requires an active line on T-Mobile so anyone currently on T-Mobile is eligible. Picked up a 9+ on Thursday. It does not require a new line activation. I added the phone to an existing line (retiring my Nexus 5x). They verify the account with the last 4 digits of the SS. The $100 Costco gift card requires online registration within 30 days and it takes up to 14 weeks to receive it. They had Black, Blue and Lilac phones in stock. Semi good deal. Sell your phone and get some $ back. But me no Costco member. Where are people seeing a $200 Costco gift card with EIP? All I see is a $100 instant rebate and a $100 Costco gift card via online redemption. I’d consider this if I could get the phone for $500, but if not I’ll wait for a BOGO. That’s what I would like to know too.